Decide this minute to never again beg anyone for the love, respect, and attention that you should be showing yourself. Be your own best friend. Trust your inner spirit and follow your instincts. Accept who you are completely, the good and the bad, and make changes in your life as YOU see fit – not because you think anyone else wants you to be different, but because you know it’s the right thing to do, for YOU. 2. They are self-conscious about what others think of them.The minute you stop overwhelming your mind with caring about what everyone else thinks, and start doing what you feel in your heart is right, is the minute you will finally feel freedom and peace of mind. In fact, you can end half your troubles immediately by no longer permitting people to tell you what you want. You will never find peace until you learn to finally let go of the hatred and hurt that lives in your heart. Life is far too short to be spent in nursing bitterness and registering wrongs. Grudges are for those who insist that they are owed something; forgiveness, on the other hand, is for those who are confident enough to stand on their own two legs and move on. Remember that the way you’ve always done it isn’t the only way. It’s unlikely that one of the things you’ll regret when you’re 70 is not having consumed enough beer in your 20s, or not having bought enough $6 lattes from Starbucks, or not having frequented the same night club for years. But the regret of missing out on opportunities is a real, toxic feeling. The bottom line is that you’ve figured out drinking and going out. You’ve had enough lattes. It’s time to figure something else out. Every corner you turn or street you walk down has a new experience waiting for you. You just have to see the opportunity and be adventurous enough to run with it. Life is often unpredictable. Some of the great moments in your life won’t necessarily be the things you do; they’ll be things that happen to you. That doesn’t mean you can’t take action to affect the outcome of your life. You have to take action, and you will. But don’t forget that on any day, you can step out the front door and your whole life can change in an instant – for better or worse. 6. They let their fears numb them from life’s goodness.“Numbing” is any activity that you use to desensitize your feelings so that you don’t experience vulnerability or hurt. But by numbing yourself to vulnerability, you also numb yourself to love, belonging, empathy, creativity, adventure and all of life’s goodness. Remember, every worthwhile venture in life – intimate love, friendship, a new business, etc. – is scary. These things are inherently risky. They are unsafe. These things aren’t for the faint of heart. They take courage. And most importantly, they can’t coexist with fear. When you open up to life’s greatest opportunities and joys it means you’re also giving life the opportunity to break your heart, but trusting that it won’t… that the risk is well worth the reward. And it doesn’t really matter if our feelings are positive or negative – they are overwhelming and exhausting, and so we prefer to numb ourselves to them. The bottom line is that we are all addicted to avoiding ourselves. Acknowledging this addiction is the first step to healing it. So begin today by just noticing with curiosity, and without judgment, all of the ways in which you avoid being in your own skin, right here, right now, in this present moment we call life. If you feel anxious because you constantly feel like you’re missing out on something happening somewhere else, you’re not alone. We all feel this way sometimes – like the grass is greener somewhere else at this very moment. But let me assure you, you could run around trying to do everything, and travel around the world, and always stay connected, and work and party all night long without sleep, but you could never do it all. You will always be missing something, and thus it will always seem like something wonderful might be happening elsewhere. So let it go, and realize you have everything right now. The best in life isn’t somewhere else; it’s right where you are, at this moment. Celebrate the perhaps not so insignificant fact that you are alive right now. This moment, and who you are, is absolutely perfect. Take a deep breath, smile, and notice the green grass under your own two feet. Let me tell you a secret I’ve learned about happiness. 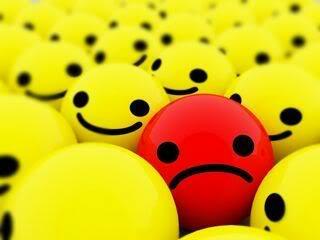 Nobody is happy all of the time. It’s perfectly normal to experience considerable fluctuations in your level of happiness from day to day, month to month, and even year to year. In fact, according to a recent scientific study, overall levels of happiness decline from one’s teens until one’s 40s and then pick up again until they peak in one’s early 70s. So the chances are that your happiest days are yet to come. Hopefully that gives you something to smile about today. What would you add to the list? What behaviors and beliefs often stand between you and happiness? Please leave a comment below and share your thoughts with the community.